As a tradition, we would like to recognize our visionary leader, Herb Hickling. Herb launched the Hub’s journey six years ago, bringing accessible primary and preventative health care closer to citizens in our community. Herb was a collaborator and facilitated community efforts to join with the District of Muskoka and begin discussions with the Province of Ontario, seeking and achieving their support. Herb also built a strong alliance with the Township of Lake of Bays and Algonquin Highlands, given that our community straddles both jurisdictions. In order to build momentum, Herb sponsored countless community engagement sessions with community groups, churches, cottage associations and the public at large. Over the years, he built up a groundswell of support for the Hub through donations and volunteer time. Thank you Herb - you would be proud of how the community has kept your vision alive. We are proud of our health care facility just over the hill on Main Street in Dorset. In our second year, we undertook some renovations and expanded the Hub to accommodate growing services and programs. We continue to believe that it is not the building that matters. What matters are the “values and benefits” that the facility and professional teams offer our community and patients most in need. In the first two years of Hub’s development, the community raised over $900,000.00 for the build, equipment, and services and programs. You can stop reading now and watch our video - it says it all! For the past three summers, we hired a nurse-in-training and offered her numerous hours of practical administrative and clinical training. This increased the Hub’s ability to provide care for patients, cottages and visitors. We have increased our lab services and now have weekly lab pick-ups. We continue to offer medications for emergencies and unexpected needs. We offer nutritional and food support for patients in need. We continue to offer discreet mental health services as needed. We continue to link patients to a number of health and community support services. We utilize the Ontario Telemedicine Network (OTN) and have connected many of our patients to their specialists. We do video conferencing for diabetic patients with the Diabetes Education Centre in Huntsville. Moreover, we have started a “lending” resources library and reference material focused on the health and welfare needs of our patients. Refer to our “Services & Programs” for more information. In February/March of 2017, the Algonquin Family Health Team guided the Hub Advisory Committee on making priority recommendations for the coming year based on existing evidence and data. Provided that a large portion of the Hub’s patients (to date) have complex and chronic care needs, some investments were made in home-care visits. With over 2,000 patient visits per year, additional professional team support is required during peak periods. As a result, investments were made to expand the Diabetes Prevention Program, Crisis Food Bag Program, Health Living and Awareness Programs, immunization days and mental health therapy. This year, we launched a fundraising campaign to fund extend summer hours for Summer 2019. “I was pleased to work part-time at the Dorset Health Hub this summer. I was thanked many times for being available for same-day and Saturday appointments. Some patients had physicians elsewhere, but due to mobility and access issues, they needed us for brief services such as wound care, removal of stitches or a bad cough. Health care in rural Ontario looks very different than care in the city. Lack of transportation to diagnostic labs and pharmacies can be a barrier - venipuncture and medication delivery services to the Hub go a long way in ensuring health equity. All Ontarians deserve the best health care possible. I’m proud to have done my part”. We are beyond grateful for the support the Hub has received over the years. Without the community’s volunteer work and fundraising efforts, the Hub would not be up and running today. In particular, we want to thank our hosts who held two spectacular parties in support of our “Hub To Hospital” campaign, which raises funds for both the Hub and the Huntsville Hospital Foundation. A dedication to these groups and individuals will made visible in the Hub in the New Year. We also want to thank the SS Bigwin July 2018 Gala for their donation to the Hub. Collin Reaney is an innovative and community-oriented individual who volunteers his time each and every day to ensure the Hub’s success. Collin has played and continues to play a crucial role in this success by securing government base funding and grants, organizing events and overlooking the Hub’s operations. Thank you for all of your work Collin - it wouldn’t be possible without you! We also want to recognize our close collaborations with the District of Muskoka, Algonquin Highlands Township and the Huntsville Hospital Foundation. 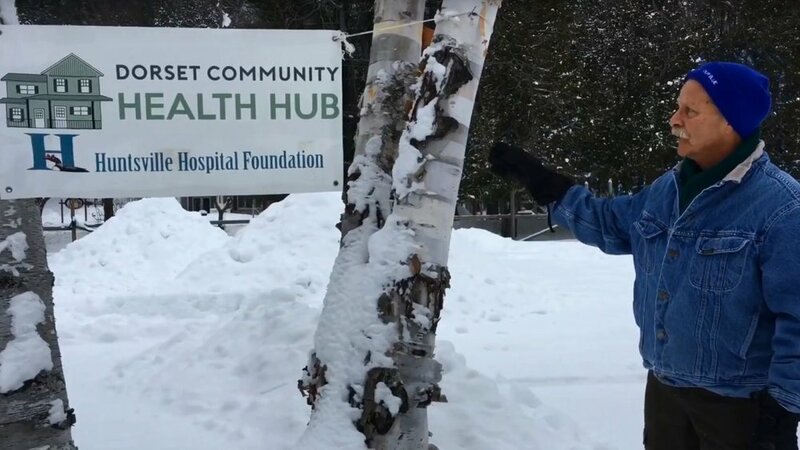 We are appreciative for the work that is done with the Huntsville Hospital Foundation and other health care providers in Muskoka and Haliburton. The Hub, along with all of Muskoka’s Hub’s won last year’s Minister’s Team Honour Roll. Our Social Services Outreach worker offers fresh fruit and veggies once a month in the winter for those in need. We support the Food Pantry in Baysville for those in need. The Baysville and Dorset Lions Clubs support the Hub. The communities of Dwight and Baysville are substantial contributors to the Hub. The Hub rests on a site where the original house was home base for a local midwife in Dorset.